lol ill be sure to tape it for you guys . make sure you have our helmet cam on tadz. the car in the commercial pulls off a Scandinavian flick of sorts. i love how the rear wheels power out of the corner. tadz.....you wont be doing that in FWD..lol. But really this is the best Ad i have ever seen. I check You-tube for RLancer videos every week. Some good US drag vids of Ralliarts beating other performance cars (check out the Ralliart VS an 06 STI, and how quickly it catches up to the subie) The "BLEND" ad had only been on the net for a day b4 I found it. Check out the CJ lancer video called "Birds and Bees" Its pretty funny too. But the wowsers here would never let an ad like that air here - Shame!! Skid pan day! Skid pan day!!!!! - Ozie???? If I was the mktg director or CEO of Mitsu Asia Pacific region, i'd sack each and everyone working in the promotion and marketing department. Absolutely rubbish and shocking as!!!! I mean just what have they done if anything to promote this car and raising awareness in the public??? That's right absolutely ZILTCH!!!! This is particularly astonishing provided this is a BRAND NEW model, a whole new product with ZERO history, so how is anybody going to find out about this car?? ERRR....how about mass media?? TV?? RADIO?? 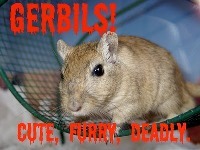 BILLBOARD?? INERNET?? MAGZINE?? NEWSPAPER?? 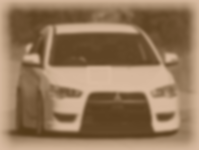 Honestly i've NOT SEEN ONE SINGLE AD anywhere regarding the Ralliart model?? And Mitsu have set s target of 200 of these to be sold nationwide every month?? Hello?? Are you kidding me?? Ohhh well, nvm, all I know is Ralliart is the most fun you can have in a car with your pants on or off. BANG for your bucks COTY handsdown for me. My whole point exactly Dejan, there has been no mention anywhere on any media source in Australia. Maybe the government has sanctions on advertising "turbo charged jap cars!" The only turbo petrol car I have seen an ad for is the new XR6 turbo. I haven't really seen too many ads for the new WRX either (but thats not a bad thing) The ownly Subaru ad is for the new impreza shape. No mention of a WRX. 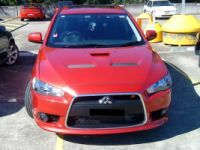 I only found out about a Ralliart Lancer cause I had been looking on carsales.com for 2nd hand sports cars and saw a sponsorship ad for the whole ralliart line up - Colt and Lancer. They (media regulators) obviously want us to buy boring Yawnodores (soon to be rebadged korean Yawnodores )!!!! Marketing geniuses for Mitsu Aus should be shot for doing nothing!!!! Sold Subaru, now have Ralliart. Need skid pan day, need skid pan day.. need skid pan day..... need skid pan day.. nnnnnnnnnnnnnnn............ waaaaaaaaaaaaaaaaaaaaaa! You said you have never seen any new car ads on TV, billboard or mags?? Err....I dont know much about Townsville and dont wanna assume anything but here down in Sydney, when the EVO 10 came out, theres billboard like on the bridge and bus stop, so thats not too bad. I've seen the 09WRX ads on the first 5 pages of WHEELS a few times, so they have their work cut out as well. Other turbo cars ummmm, new Saab 9-3 i've seen that ads with the Whale flipping i dont know if you remember, i've seen a lot of the XR5 turbo ads when the car first came out, remember GTI?? Theres ads of them EVERYWHERE, and still are, so pretty sure theres no such rules when it comes to promoting Turbo cars. But heres the thing WRX and EVO both have a long history and a legacy, EVERYONE KNOWS EVO AND WRX, cos they have been around for at 14+ years, and people are aware of these cars, they dont need extensive adverstiving and massive promotion like a brand new performance car. Ralliart is different, this is the first edition of its kind since the ill-fated GSR which never took off, so in my opinion it is quite paramount and critical that we get off to a flyer and make sure the car's image and positioning really get sunk in deep in the consumers mind when it comes to turbo choice cars and performance categories. But from what i have seen so far, MITSU have really failed its first step - the most important one. I feel sorry for everyone out there who's never heard of a Ralliart, cos they have no idea what they are missing out on, but it does make me feel pretty cool at times that i am part of such an elite and exclusive league. 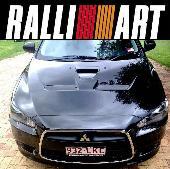 Go on, Ralliart, embrace yourself!! No....no......I meant the main advertising genres........TV - no ads for it or EVO 10. Radio - Nothing up here. I know the Ralliart was probably in car mags around Australia, but to not even have some kind of ad on TV to say "Hey, this is new, its friggin sweet, and its an alternative to the big 6-8 cylinder cars on every second ad" (If I see that Holden ad telling people that times are tuff but holden and holden buyers are tuffer I'm gonna set alight a couple of "Aussie" Daewoo Barinas!!!!!) I know they couldn't have done an ad like the one on You-tube that I found, but do some kind of clever ad to promote this car. It deserves it!! As for billboards - the city doesn't have any. We don't have any motorways in or out of the city, and because the whole city is within a 7-10km diameter, there isn't much needed to advertise. Its a shame, because I drove through smaller towns on the way back from Brissy, and they do have these boards up. Woops, I meant new Nissan GTR, not an old crappy 15 year old one!!!! I too would be very interested to know the sales figures for the Ralliart models since end of last yr, and I wouldnt be holding my hopes too high on that one either. The problem is exactly what u pointed out Azza, the shortage of supply and lack of marketing strategies. I was actually the second registered Ralliart owner in NSW (they showed me the details on the computer database, the first one taken was a blue Ralliart a day before I did). They explained to me in depth and specifically mentioned about how Ralliart is an exclusive model and is by allocation only - meaning, when you order the one you want, they'll ship it for you here from Japan. Gosh, sounds like a customer order of a brand new M3 E92, which I kind of felt disappointed but privileged at the same time - werid feeling!!! So when i decided to go for a rear red one with the MMCS sat nav, sunroof, leather seat and sound package in a sedan, THEY COULD NOT GET ONE!! Even tho all of these are standard options and nothing fancy. Fortunately they were able to get the colour that I want and the best they could do is sunroof and sound package, and even that had to be shipped from Adelaide!!!! The alternative is a 3 months wait for the January shipment cos none of the 25 cars onboard at the time from the first shipment had the MMCS on, how ludicrous?? Having said that, i consider myself to be fortunate to be the loud and proud owner of a Ralliart vehilcle and one i'm definitely intending to keep for the next 3 yrs at least, and will always be the pride of my ride. When did you get yours Azza and how long did you have to wait for it?? Funny story, was going down to Brissy for holiday. I wanted to get a new car down there and drive it back. Rang up Lotus dealer to enquire about a Lotus Elise. If he and I could have agreed to a deal, I would of ended up with a red elise. But the Pr*ck wanted way more than he deserved so I told him where to go and hung up on him!! 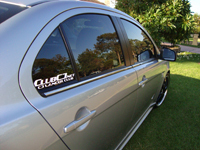 While looking on carsales.com I came across an add for the Ralliart line up - Colt, Lancer. I didn't even know they existed. I went to Mitsu up here in Townsville. They had one red sportback demo model and I made them check the QLD database to find out who had a black sedan. There were 2, both at same dealer in Brissy. One had R-Fosgate package and that is what I wanted. Went down to Brissy the next day, had the manager of the dealership pick me up from the airport in a black ralliart sedan (another demo model) signed the deal and drove down to the goldcoast later that afternoon. (December 12, 2008) Drove back to Townsville the next day - It had done almost 2000ks and went in for first service after 3 days!!!! Since then, she only goes 200k's a week tops!